[By Nick, discontinued] Would you believe me if I said I’ve never had Starbucks coffee before? Better yet, how about if I said I’ve never set foot in a Starbucks in my entire life? Well, it’s true. Now don’t make me out to be some kind of Starbucks hater because I’m not. I’ve just haven’t had a reason to go and up until a few years ago there wasn’t one even in a reasonable distance of me. Well, what more ironic way to break my Starbucks-less streak than by trying the now discontinued ice cream flavor modeled after one of their best-selling drinks? 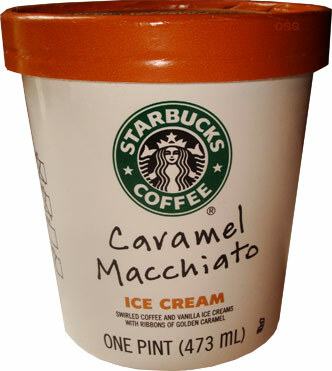 Okay, technically Unilever makes made the ice cream but it says Starbucks on it so it’s good enough for me. Seeing as I’m oblivious when it comes to Starbucks and coffee drinks in general, I have no idea what exactly a caramel macchiato is. My best guess would be just coffee flavored with caramel syrup. Well after some extensive research (as in going to Starbucks’ website), a caramel macchiato is “freshly steamed milk with vanilla-flavored syrup, marked with espresso and finished with caramel sauce.” Yeah, I was nowhere close to being right. Well that new found knowledge is fine and dandy but we’re dealing with ice cream here and not the drink. According to the pint, this flavor is made up of “swirled coffee and vanilla ice creams with ribbons of golden caramel.” Well if that’s not the perfect replication on paper of the flavor profile of the drink in ice cream form then I don’t know what is. Removing the lid, this one is definitely swirled. Though I can mainly see the coffee ice cream, there is some vanilla peeking out. That would be a sign of things to come because of the two ice creams; the coffee is the dominating one flavor wise. There are subtle hints of vanilla every now and again but it’s the coffee ice cream that takes center stage. That’s not a bad thing though because this is some quality stuff. While not super intense, there’s a bold well rounded to it. There’s a pleasant roasted flavor that is complimented by the notes of vanilla that manage to shine through. Now that I think of it, the coffee flavor sort of reminds me of Ben & Jerry’s coffee base. That would make sense seeing as Unilever produces both brands. 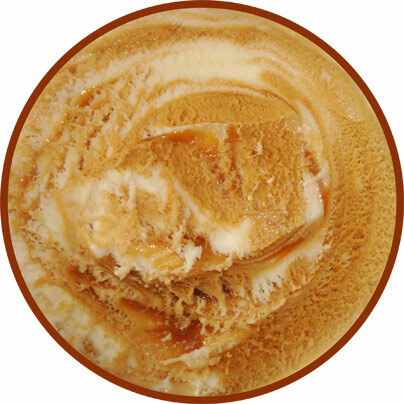 Sadly though, the caramel is dominated by the coffee just like the vanilla ice cream,. I can’t pick up any of the caramel flavor at all. 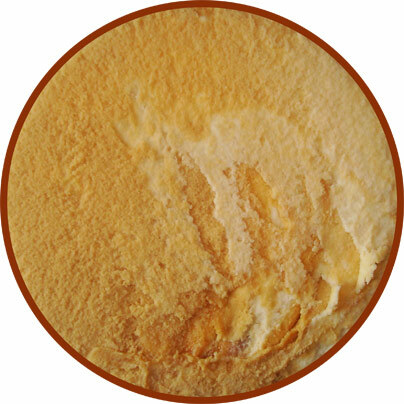 If anything, it does add a bit off sweetness and a textural component because it is nice and gooey. Speaking of texture, I was surprised at how dense and creamy this ice cream is. I’d say it would fall into the same category as Ben & Jerry’s and Haagen-Dazs. I’m kind of torn on this one. While I do enjoy the coffee ice cream aspect of this pint, the other two components are practically M.I.A. If you were to tell me this was coffee and vanilla espresso (that’s a thing right?) ice creams swirled together with a gooey coffee syrup ribbon, I wouldn’t question you. I guess when it comes down to it, this one fails as a whole. I’ll just pick up a pint of their regular coffee ice cream next time and customize it myself. Verdict? If you really like coffee ice cream it’s worth a try. You and I must be the only two people on the planet who don't go to Starbucks! I'm intimidated that I don't know the language and will hold up the line while trying to figure out what to order. I've seen this ice cream at Target but never tried it. Guess I missed my chance now that it's discontinued. Enjoy the rest of your holiday weekend Nick! @Anon: I can definitely see it being intimidating. I'm just not enough of a real coffee drinker to even want to deal with all of that. I'd probably just point at someone else's drink and ask for that aha. They recently discontinued the line so it is possible you'll be able to find some pints left. Thank you, and you enjoy your holiday weekend as well! Make that 3 of us. I don't like coffee and I don't drink it, and I've stepped into a starbuck store because my sister likes it. I was so lost looking at the menu that I got dizzy and quit, but I did taste the ice cream and I got hooked. I could not find it in my local commissary so I started the web search and now you say it's discontinued? I'm going to quit falling in love with anything. Each time I do, it gets discontinued. The story of my life.